Never Alone Again is an organization that was created in 1999 to offer empathetic support for victims of domestic abuse. Motivated by personal experience and the awareness of a need for a safe haven, NAAG was developed. We are a non-profit organization that is dedicated to providing high quality and individually tailored support services to victims and survivors of domestic violence/abuse. If you like to Sponsor our Upcoming Events Please Contact Us. POP 2019 (Prevention, Opportunity & Preparation) #Summer #Youth #Workshops are designed for #adolescents to explore #future goals through Soft-Skills training. POP will utilize area #professionals and successful #community peers to give #motivating #presentations on age specific topics twice a week for 10 weeks. 90 minute workshops include literature, group discussion and hands-on activities. Join us as we empower “Kernels” with tools to #encourage #healthy & #realistic goal-setting, preparation & planning for higher #education, healthy lifestyle choices, financial literacy, community awareness and good personal hygiene habits. Facilitators will share their unique talents, ideas and expertise to make our “Kernels” POP! As you can see the above chart indicates how pervasive the problem is and how much work there is to do. How can you help us? Become a member of Never Alone Again (NAAG). Get involved and donate your time, talent and treasure. Volunteer to help and give what you can. Remember, we are a non-profit organization so every dollar you donate helps to keep a woman safe and is tax deductible. To help offset the cost of running the organization we have included Membership Enrollment Form. We understand that the need is great and with our country’s current fiscal crisis, it is challenging to find funding options. However, we hope that you will help us provide safety to women, children and families in our community. We can only make it if we ALL do our part to help out. We look forward to our community partnership with you and hope we can count on your support. Thank you for taking time to review our correspondence. Thank you in advance for the help that I know we will receive from our community partners and friends. You have our eternal thanks, gratitude and respect. FREE CLOTHING – FOOD- BABY ITEMS- BABY FORMULA- BABY CLOTHING- WARM COATS, SHOES BOOTS ETC. To date over 200 children and counting at Never Alone Again have been adopted by Secret Sponsors for our Annual Holiday Toy Distribution Event on 12/23/2018. Thank you for being a blessing to our children and families at Never Alone Again. feeling thankful at Never Alone Again Resource Center. Pastor Loretta Hall, & Elder Mrs. W. Brown,Progressive Faith Ministries, Renee M Smith-Wilson Carol Y. Wilson,Tonza Houston and Mom, Shantae' SingletaryCyndy O'Day Mitchell, Michelle Poole,Michele Bowman, Lovely Ali (Face Painter), Kasana Akridge, Janel F. Johnston, Penninah Drakeford-Green,Ms. Toby, Measy Conyers, Cheryl Hawkins, Theresa Gift, Mrs. M. Dunn and everyone who donated to help make Never Alone Again Holiday dinner a HUGE success. If you want to know more about Never Alone Again DV Organization and Resource Center Up Coming Events and our Programs and Services please visit. Never Alone Again Resource Center & DV Organization. 2018 Back-2-School Supplies Distribution Community Event Saturday 9/1/2018. was a Huge Successful Community Outreach Event hosted yesterday at our new location 668 American Legion Drive #5 Teaneck NJ. Muhammad who did an awesome job face painting and everyone who I didn’t mention thank you, thank you. NAAG Resource Center in the community. And a Special Thank you to Author Jelonda Thomas-Foster she just step in keeping everyone entertained “If your Happy and you know It Clap your Hands” Thank you. Hello family and friends! We really need your help. As you are aware 2018 back to school time is coming up. We are trying to be a blessing to our families within our community. Many families in our area are in need. We want to step in the gap and help. The way in which we can all do that is by giving back. There is something we can ALL do no matter how big, how small, how much or how little. I want to personally thank everyone that came out to the Resource Center on saturday in the rain to support NAAG’s Sip & Paint Event & Donating Schools Supplies. We had an awesome FUN Time! Details to follow of our next Painting Event. Admission: Donations of School Supplies for our Back to School Drive. Often families and individuals come to us with literally nothing but the clothes on their backs. NAAG’s Resource Center allows our clients and neighbors to get the items they need to begin to reestablishing their lives. Never Alone Again Resource Center (NAAG) will open its doors on Friday, July 27 thru Sunday, July 29th for our Community Outreach Event to anyone who has a need for clothing (Newborn to Adults M/F-All Sizes) coats, shoes, sneaker, boots (all sizes), baby strollers, toys, books, household items and more will be displayed at our Resource Center. The Resource Center is truly a vital service to help families, children, single adults, and our neighbors in need who are on a limited budget or with no money or income. We are here to be a blessing..
Never Alone Again Resource Center has a new location where we can continue our programs, resources, services, workshops, career development and job training, support groups, music and art therapy community outreach awareness and so much more. We do need your support with our wish list. gifts for new babies and those going into new homes. Target, Walmart, Lowe's, Home Depot, Staples, and Visa and MasterCard gift cards for much needed clothing items. Thank you and thank everyone for your support. Never Alone Again Domestic Violence Organization and Resource Center of your Commitment and Dedication in serving others and your community. Sarah's mission's Mother's Day committee with the phenomenal Valerie Adams 💚 Thank you all for making this a successful Mother's Day event/fundraiser. Together we raised over $500 for Never Alone Again Domestic Violence Organization and Resource Center, founded by Theresa F. Johnston, Guest Speaker and a community award winning activist. If anyone would like to donate, please do so at neveraloneagain.org. Thank you Theresa for all you do to help victims of domestic violence/abuse. Thank you Rhonda Warren-Glover for inviting us to such a wonderful inspirational mother's Day Brunch. 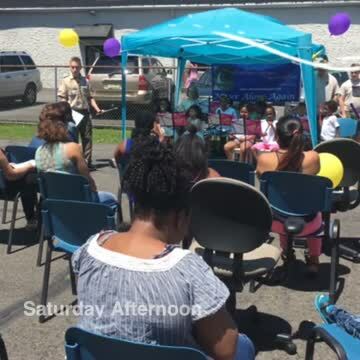 Another Successful Mother's Day Event at Never Alone Again Resource Center. Many of the women and their families at NAAG was blessed with Beautiful Mary Kay Mother's Day Baskets and Gift Bags. Even though we couldn't show their faces. They were very appreciative of your thoughtfulness to bless them with these gifts for Mother's Day. Thank you. I want to give a special thank you to Renee M Smith-Wilson and my VBB's Sisters, Theresa Wilkerson Brown and The Brown Believe Area. The Mary Kay spa baskets and gift bags. Thank you to the Englewood Car Wash, Alywards Health Store, Englewood, Hair Simplicity in Englewood Gaitree James Shakoor, Melanie LeSane, Mrs. Thomas, Samantha Sheridan and everyone who supported and donated. Heel My Sole 2018 Prom Dress Project. The 2018 Heel My Sole Prom Dress Project offers free dresses to young women in need and the opportunity to select a Prom Gown, heels, make-up and accessories free of charge to attend their prom and formal feeling confident, stylish, and proud. This project also teaches young women about etiquette, hair, make-up, loving and respecting yourself and teen dating violence awareness. Inviting all High School Students who are in need of a Prom Gown, Formal Wear, Heel/Shoes and accessories to wear on that special day. Justin Eagle Scout Music 🎶🎶🎶Project today at Never Alone Again was A Huge Success! Thank you to the participants and everyone that came out to support this project and of course the Naag Team! Congratulations to Justin Merkovsky Eagle Scout Court of Honor. Justin’s Eagle Project was to teach and implement fundamentals of music to our children at Never Alone Again Domestic Violence Organization and Resource Center. Justin's Eagle Scout Music Project touch many of our Children and Families at Never Alone Again. God Blessing to you on your future endeavors. Congratulations on Justin for receiving your Eagle Scout Court of Honor Achievements Awards. New Englewood Food Pantry Shiloh A.M.E Zion Church Assisting families in Need. Shiloh's Food Pantry has Blessed many families in the community and to many of our clients at Never Alone Again Domestic Violence Organization,Theresa Johnston, CEO. Thank you Ms. E. Adams, Ms. Janie Wright, Mr. Frederick L. Johnson Rev. Givens, Mr. Carter Jackson and Mr. DeQuincy Elmore and All the Committee members at Shiloh and congregation. Thank you Daniel Munoz for writing article in suburbanite. The Shiloh Food Pantry has Blessed many of our families today with a Turkey and trimmings for thanksgiving dinner. We will continue to get the word out! To be a Blessing to many. Register every 3rd Thursday of each month at 201-289-1718.